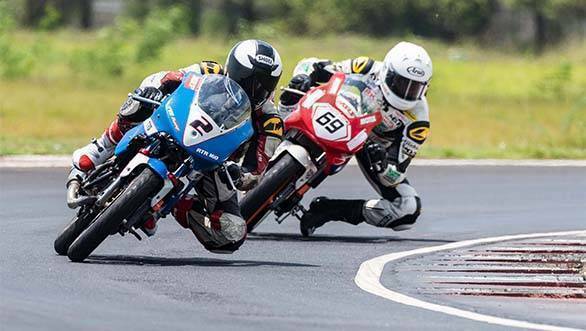 It was a thrilling weekend at the third round of the MRF MMSC FMSCI Indian National Motorcycle Racing Championship, held recently at the Madras Motor Race Track (MMRT) in Chennai. On Day Two, the Super Sport Indian (165cc) race witnessed some intense racing and closely fought battles. The drama began even before the race began, as championship leader Jagan Kumar was disqualified due to a technical infringement. The TVS Racing rider had qualified on pole position, however, the penalty saw him line up at the back of the grid. His team-mate, KY Ahmed made the most of this opportunity and won the race after putting on quite an impressive show. He swept past ace racer, Rajini Krishnan at C2 on the first lap itself, making his intentions pretty clear. Rajini, who began on pole, was in hot pursuit from then on but had to retire on Lap 4 after his bike suffered a technical issue. 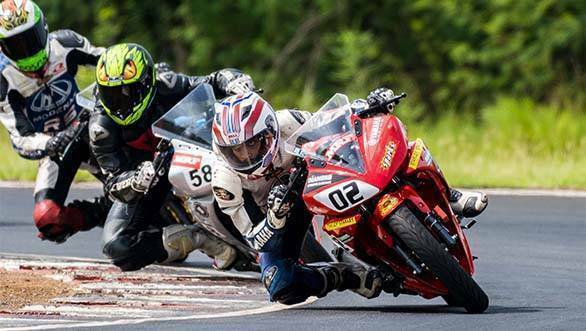 This promoted Sarath Kumar, of Honda Ten10 racing to second. Deepak Ravikumar of Team RACR finished third. Jagan Kumar had a race to forget as he crashed at C2 on the second lap. He said that he was pushing hard, trying to make up for the lost ground. At the end of the day the only consolation he had was the fact that he would start Sunday's race on pole. In the Pro-Stock 165cc Race, Performance Racing's Kannan Karnan beat D Dinesh Kumar and Prabhu from team RACR. The gap to Dinesh Kumar was a miniscule 0.8 seconds, such was the intensity of the battle. Prabhu crossed the finish line after 3.8 seconds. Team Rockstar Racing had a great Day One as its riders grabbed all podium positions in the Super Sports Indian (300cc-400cc) class. Ami van Poederooijen took top honours, crossing the finish line nearly 5 seconds clear of second placed Abhishek Vasudev. Amarnath K Menon finished third. The Stock 165cc class race was won by Antony Peter of Performance Racing. Joseph Mathew of Sparks Racing secured the second position and Anish Shetty from team United Tech Torque finished third. The action on Day Three was even more intense with some incredible racing in all classes. Jagan Kumar had his work cut out for Race 2 as he sought to consolidate his championship lead. The TVS Racing rider managed to put on an good performance and cross the finish line in P1, 1.6 seconds ahead of Sarath Kumar. Deepak Ravikumar of Team RACR finished third. Jagan Kumar leads the championship with 108 points. The Stock 165cc Race witnessed some close battles with Championship leader Anthony Peter having to fight tooth and nail for a podium place. Race winner Joseph Mathews of Sparks Racing made a brilliant start and managed to overtake Peter on the First Lap. Down in second, Peter was trying hard to maintain P2. However, a few laps later Soorya managed to overtake Peter pushing him to third. Peter began chasing him quickly and managed to grab P2 again. While this battle was on Anish Shetty of team United Tech Torque was steadily closing on the leaders. On the last lap, he launched an attack, rising from P5 to P2, demoting Peter to P3. The Pro Strock 165cc Race was won by Rajiv Sethu of Honda Ten10 Racing. He won by a considerable margin, of close to eight seconds, over Prabhu A. Hari Krishnan R of Honda Ten10 Racing finished a close third, managing to maintain the championship lead. 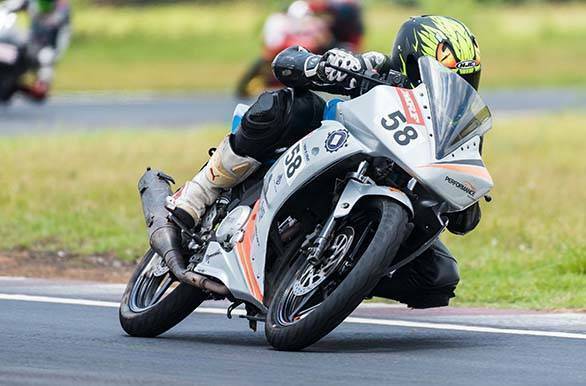 Ami Van Poederooijen had a successful weekend, winning the Super Sport Indian Race (300cc-400cc) on Sunday too. His team-mate Abhishek Vasudev finished second, crossing the line after five seconds. Ananth Raj P of team Pro Lap Racing finished third. 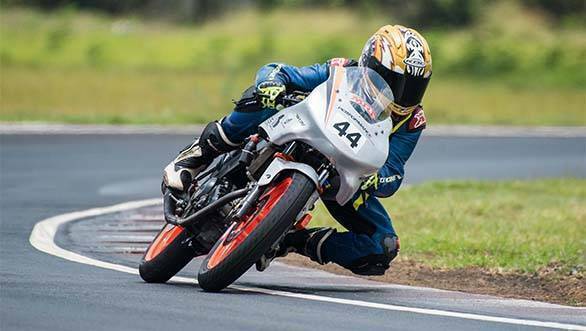 In the TVS-MMSC Apache RTR 200 Open class Kannan Karnan took top honours, beating Vivek Pillai to the finish line by a whopping 13.8 seconds. T Ramakrishnan was third. In the Novice Class, Yashas RL from Bengaluru won the race by a considerable margin. Yuvraj S finished second followed by Kamran Alam. The Honda CBR250 Class, races were won by Team Honda Ten10 Racing rider Mathana Kumar. The Honda CBR150 Novice Race was won by Anish Shetty. 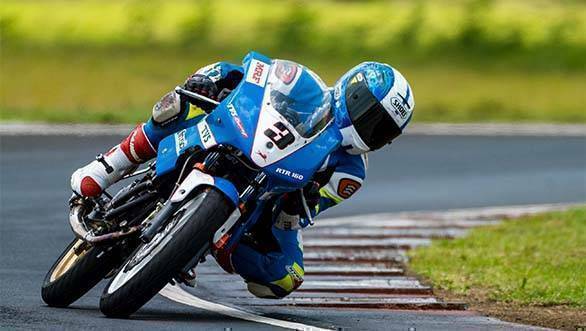 In the Suzuki Gixxer Cup Novice Race, Joseph Mathew won finished first. Anthony Peter finished a close second followed by Amarnath Rajan. The Open Race in this category was a thriller with the podium finishers separated by hundredths of a second! The Race was won by Meka Vidhuraj who managed to thwart an attack from second placed rider, Vivian Gladwin David. The gap between the duo at the finish line was a mere 0.015 seconds. Rajanikanth B finished third, 0.167 seconds behind Vivian. The Suzuki Gixxer Rookie Cup Race was won by Sachin Chaudhry. The youngster was leading by quite a margin, eventually crossing the finish line a full 21 seconds ahead of AS Alexander. S. Varoon finished third.